Ever since the lesser known player in the luxury car segment, Volvo Motors introduced the Volvo S60 in India, all the Germans and British are a worried lot. Not only has the Volvo managed to gather outstanding bookings for the S60, it has also managed to have a genuine waiting period. Imagine people having put their money on the Volvo and now waiting to receive the keys in their hands. A dealer I happened to know quoted a 3 month long waiting period for both the editions of the S60. That should really say something about the potentials of this car. Well, I had actually compared the S60 with the Mercedes and BMW equivalents. However I conveniently forgot the other German, the performance king, Audi. Audi with its A4 and the brilliant 3.2 TFSI engine have been on the top of shoppers list, out for an entry level performance luxury sedan. However with the advent of the Volvo S60, it seems that a fight has to be carried out between these two contenders and a winner to be decided. The S60 carries a huge burden of having won the last competition and how it stacks up against the Audi is to be seen. So the Audi A4 3.2 TFSI in India and the Volvo S60 T6 in India go one on one and a detail of the same is provided herewith. As far as looks go, the Audi A4 clearly overshadows the Volvo. Not only does it look bigger but it also has a better road presence. Seeing the Volvo in recent months has made me to believe that the new 2011 Ford Fiesta would also be looking like this. The fact that Ford have handled Volvo some or the other time may have inspired the design. Well, back to the A4, I am sure that most of you wouldn’t be able to recognize if the Audi coming from a distance is the A4, A6 , A7, TT or even the A8. They all feature the familiar goatee grille with 4 rings on it. Plus the angel eyes LED daytime running lamps. The Audi A4 3.2 TFSI in India model is the top line variant available for the A4 range. This Audi comes with all the bells and whistles that one can hope for plus many optional extras. Audi used to offer 18 inch wheels for the 3.2 version however off late, they are offering only 17 inch alloys on all the variants. This, I am being told, is in the better interests of ride quality. Both the cars in this competition have got their outside rear view mirrors clipped on by the turn indicators. The Volvo’s design theme is more like a drop of water. This means that the Volvo is more aerodynamic than the Audi. On the Volvo grille comes a standard safety feature of which, I would discuss later. The small box on the grille gives a hint of what exactly it is. A good placement of the daytime running LEDs is that outside the head lamp cluster. No fog lamps are being given, even as an option. The one thing is that the Volvo looks an angry machine and so does the Audi. While the Volvo may look like a bit on stilts, the Audi is more ground hugging than its competition. Volvo also offers 17 inch wheels as standard on its S60 sedan. Come to the rear and the Audi is the more conservative while the Volvo punches back with a L shaped tail lamp. If you place an Audi and BMW side by side, from the rear, both would look the same, save for the badges. However the Volvo begs to differ. It not only looks better but the raised hump signals that a station wagon version may be on the way. Its twin tail pipes look way chunkier than the ones on the Audi. Choose a pick out these two and you wouldn’t go wrong with either of them. However the minimalistic fussy design of the Volvo thrills however I warn you that, come the 2011 Ford Fiesta and the Volvo wouldn’t look worth the premium that it commands over the Ford. However that is only and purely as far as the looks go. By the virtue of being a fresh design, the Volvo wins. The Audi A4 3.2 TFSI in India has the same interiors as one would expect from any other Audi. Highly detailed and functional. Buttons are limited to not only the central console but also on the door pads. The easy to read dials and multi information display nestled in between them look very good when lit up. But then being in an Audi is similar to being inside a digital instrument gallery where each and every instrument has certain set of functions plus have knurlish knobs to operate them. The leather wrapped steering wheel is one of the meatier kinds. There is a fake wood trim on the passenger side and that looks a bit out of place in this all black cabin. Simplifying things are the Multi Media Interface or MMI which is good as it dispels away with most of the buttons and makes use of a single touch to access the different menus. However some functions are indeed complicated like the start of the fan and significantly its turn is handled by another button. Wish, the A4 also gets the wonderful latest generation MMI system from the A6. 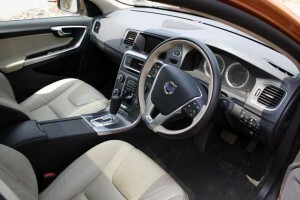 The Volvo’s interiors are definitely a different cry than that of the Audi and looks less fussy. What it has to boast is the floating central console them which is unique to cars in this class in India. What immediately strikes you is that this is a car which would withstand the rigors of time very well. Everything inside feels solidly built and the plastics are nice to touch. However tad too many buttons on the central console spoil the party. Moreover, the driver interface on the Volvo is called as Sensus. The wood trim which houses the central console is also a bit downmarket looking. However the seats are far better built than that on the Audi and comfort level is one notch above that of the Audi. On a long drive, the Volvo’s seats seem the better ones. The Audi’s seats in the meanwhile hug you in the right places however such a seat would become a bit tiring after a long drive. Come to the rear seats and the longer wheelbase and proportions of the Audi don’t translate to good interior packaging. Though there is enough of leg room at the rear, the seats are a bit on the tinier side and moreover they don’t have a good thigh support to them. The upright seat posture means that there is a big time problem as far as comfort is concerned. The transmissions tunnel intrusion in both however is a not an issue. The boot space in the Volvo however is far lower than what the Audi can offer. For the statistics, the Volvo’s boot can store 339 liters of luggage while the Audi’s takes in 480 liters. This is a deficit of approximately 150 liters. Ahh, coming to the boot, the Audi has a space saver in its boot while the Volvo only has a puncture repair kit. That looks to be a severe oversight from Volvo. On the equipments list is a 6 CD changer system which is standard for both however paying around Rs 1.24 lakhs would give you the Bang and Olufsen music system for the Audi, which is a benchmark in itself. This music system is Aux and USB compatible. Bluetooth connectivity is a given on both the cars. However the Audi trounces the Volvo by offering an optional hard disk drive. It’s the Audi which offers more equipment however the S60 is the more comfortable. You decide which one you want out of the two. The A4 has the legendary Quattro system aiding it and this means that it has leech like grip around corners. However the system in itself doesn’t explain the prowess of the car. This Quattro system is actually an improved version of the previous Quattro and splits the torque 60:40. 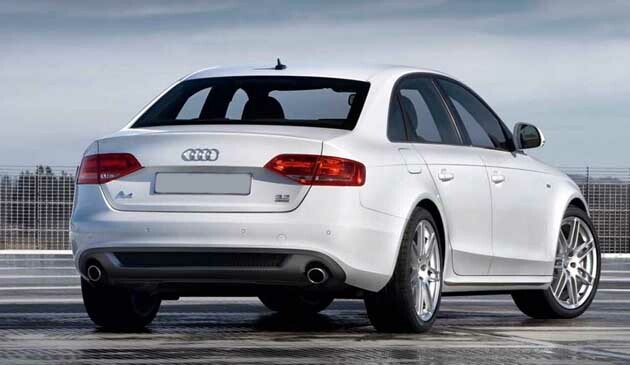 However the weight distribution means that the A4 carries the maximum of its weight over the front wheels. Audi have tried to move the engine further back into the engine bay so that the front wheels aren’t taxed much. First of all, the lower stance of the A4 meant that I had to be extra cautious while going over speed breakers and in Mumbai, there are a tad too many plus unmarked ones. The steering wheel of the Audi A4 is also one of the best in its class. It not only delivers proper feedback but also ensures that the car reaches the intended path and not somewhere else. Mind you, there is enough of power that the wheels can easily break traction. However the tyres of the A4 are huge and they have massive grip. Moreover, the all wheel drive and suspension setup ensure that the A4 is very agile in corners. However at the limit, the A4 does understeer . However all this handling means that the A4 isn’t as pliant in the ride quality department. It lets you know how bad the road is. This is where the Volvo S60 T6 comes into play. It has also got a torque vectoring system which allows the power to be sent to all the four wheels. Only the sharpest of the ruts would filter inside the cabin and at low or high speeds, the Volvo would actually isolate you from the road. Its handling, though not as sharp as the A4, is very involving. It does understeer considerably more than what the A4 does but then a prod on the accelerator is more than enough to get it back into line. The Volvo’s motor is also the more vocal of the two with the TSFI displaying a muted profile. The S60 with its brilliant mix of ride and handling. All the real pizzazz of the look would go in vain if the cars don’t really perform on the road and at traffic signals. The Volvo S60 T6 in India has got a 3.0 liter turbo charged engine which has 6 cylinders in a line. This turbo petrol makes 304 Bhp of peak power at 5600 rpm whereas the torque is a huge 440 Nm at 3800 rpm. Assisting it in transmission duties is the 6 speed automatic. Both the cars in this competition come without paddle shifts. The Audi’s 3.2 liter V6 engine is a direct injection unit. It makes 265 Bhp of power at 6500 rpm whereas the torque is also at a lower point than the Volvo at 330 Nm coming in at 3000 rpm. A 6 speed automatic transmission with DSG handles the gear shifting duties. In a straight line, the Volvo eats the Audi for lunch with its 0-100 kmph times of 6.3 seconds as compared with 8.5 seconds which the Audi takes. Top speed for the Volvo is also higher by 10 kmph. While the difference between both these cars till 100 kmph speeds doesn’t look like much, the Volvo’s tractable motor ensures that the gaps widens even more when both hit the 170 kmph mark. At this point, the Audi is trailing the S60 by a good 5.8 seconds. The gearbox of the S60 just about gets the job done however the DSG on the Audi works brilliantly. It downshifts when you want it to and is an overall refined unit. Brakes are the weak link in the entire S60 package. I experienced some fade after a fun urgent brake attempts. However the ones in the A4 don’t show any fade at all. Both the cars come equipped with ABS and ESP. In addition, the Volvo can brake itself if it detects that an immediate collision is on the way and the driver is a bit slow to respond. Moreover, the Volvo boasts of safety systems which only a custom made Mercedes S-class can boast to offer. Some very useful ones like the Bluetooth cutoff wherein if an incoming call comes when the S60 is overtaking any vehicle, then the display system doesn’t show the call until the maneuver has been completed. Pedestrian detection system which brakes or slows the car if it sees that there is a pedestrian approaching and the driver hasn’t applied the brakes. This means, you cannot kill anyone with your car, even if you wanted to. Jokes apart, the S60 is the safest cars that one can buy this side of Rs 1 crore. However the Audi may not boast of any active safety features but it definitely has 8 airbags compared with the 6 that Volvo offer. Now comes the fuel efficiency part. I recorded a figure of 6.7 kmpl in the city and 11.2 kmpl on the highway. For the Audi however, the figures were lower at 5.4 kmpl and 9.4 kmpl at the city and highway roads respectively. 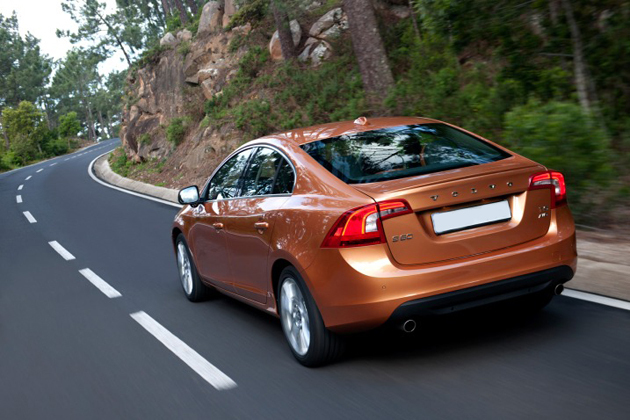 The Volvo S60 T6 wins this bout due to a faster engine and better safety features with good fuel efficiency as well. Earlier on, I would have happily recommended the Audi A4 to anyone looking out for an executive entry level sedan. However times have changed and it seems that the Swedes are all set to rule. Not only does the Volvo beat the A4 in its own game but has also raised the bar higher for any future competition. Agreed that its interiors may not have the panache of that of the Audi however significantly more space and comfort means that this is easily forgiven. Moreover the wide array of safety features ensure that you wouldn’t end up in a crash and even if you do, you come out safely out of the car. The Audi A4 also is a pretty much safe car with all those 8 airbags stowed away in all the nooks and crannies. It has got the much needed road presence and a fantastic interiors. However build quality seems a tad lower than that of the Volvo’s. It has got performance all around with its brilliant direct injection technology however it still cannot beat the turbocharged S60. Oh, if you need boot space, the Audi offers it in plenty. Moreover, Audi has got a somewhat established service network than Volvo and this tilts the favor towards the German. However the pricing factor tilts the favor back to the Volvo. For all this performance and safety, the Volvo S60 T6 price in India is Rs 34.03 lakhs while the Audi A4 3.2 TFSI price in India is Rs 36.49 lakhs Both these prices are ex-show room, Mumbai. This price for the A4 is even before the options are ticked in. Ticking the options takes the A4’s price close to Rs 46 lakhs. Very expensive. My choice for the day then is the Volvo S60 T6 in India. Mum wouldn’t have to worry over you now, if you choose the Volvo S60.